Source: Camp Dresser & Mckee, Inc.
As solid waste in landfills decomposes, it generates gas. If not controlled and monitored properly, this gas can build quickly and migrate underground beyond the boundaries of the landfill's impermeable cover system. Camp Dresser & McKee Inc. (CDM) designs and installs landfill gas management systems that remove and treat landfill gas and offer the possibility of converting the gas to a useful form of energy. 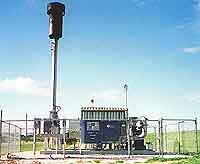 Landfill gas management systems can remove nuisance odors, improve safety for landfill neighbors, and convert the gas from a liability to a valuable energy source. Camp Dresser & Mckee, Inc., 2400 Louisiana Blvd Ne, Afc #5---Suite 740, Albuquerque, NM 87110-4316. Tel: 505-8813077; Fax: 505-881-6169.